This page is an illustrated list of the guns (apparently they are guns, not cannon, when they're on a ship), ordered from the highest above the waterline down to the nearest the waterline. This isn't quite the order in which the guns are met when touring the ship, or the order of weight of shot. 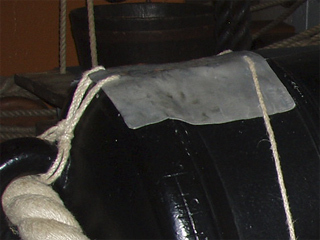 The information is taken from the information panels beside the guns aboard HMS Victory. 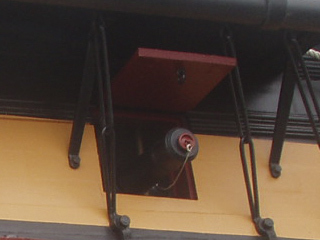 In all cases except the carronade the figure given for the gun crew assumes broadsides are being fired from both sides of the ship, indicating the minimum number of crew needed. If targets were only being engaged on one side the crew would be doubled. 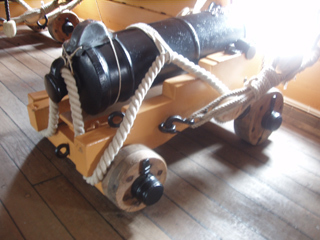 There should be 10 short 12 pounder guns mounted on the quarterdeck, but they hadn't been installed at the time these photos were taken. 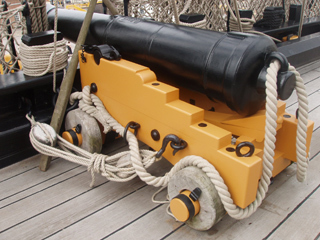 The carronade had a short barrel and used a small charge to fire a heavy shot at a low velocity. This resulted in massive damage at the point of impact but was only effective at short range. 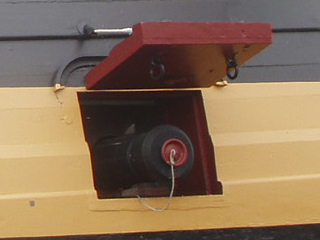 The shortness of the barrel led to complaints that the gun could set fire to the rigging of its own ship. 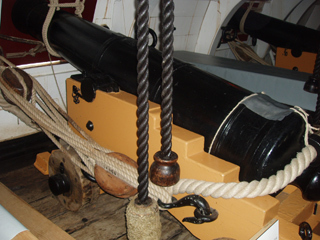 The carronade had a high centre of gravity as it was connected to its sliding carriage via a ring under the barrel rather than by trunnions on the side. 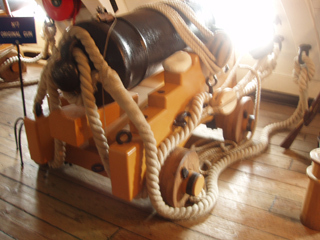 The sliding mount allowed the direction of fire to be changed easily, but meant that the carronade couldn't be moved around the ship. 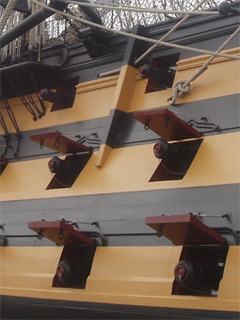 When HMS Victory was commissioned in 1765 the lower gun deck was equipped with 30 bronze 42 pounder guns; by 1803 the Navy had decided they were too heavy and cumbersome, needing a large crew and not producing a good rate of fire. In 1803 they were replaced with the more efficient 32 pounders above. 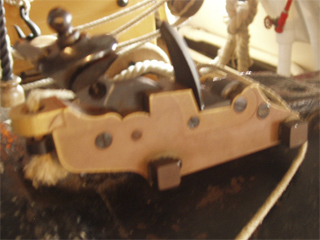 Gunlocks were first used by the Royal Navy in 1755. 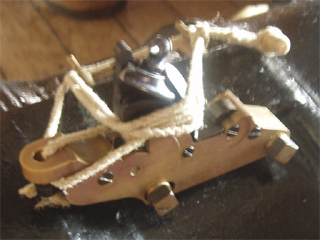 Supporters of the new mechanism argued that the gunlock allowed the gun to be fired instantly, while the traditional linstock and slow match process included a delay. 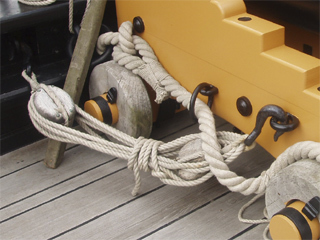 As a ship at sea tended to move about quite a bit this could make an important difference between shooting at an enemy ship or shooting into the sea or sky. The gunlock was made of brass and was, more or less, the firing mechanism of a flintlock pistol attached with bolts and butterfly nuts onto the breech of a naval gun. 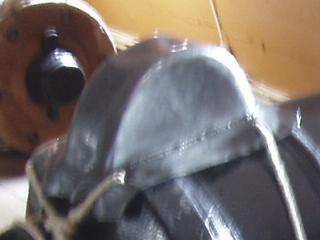 When the gun was loaded the gunlock was loaded as if it were a pistol or musket, a quill tube of powder was put into the vent, the lanyard was unwound and the hammer pulled back and cocked. When everyone was clear and the target selected, a sharp pull on the lanyard released the hammer; the flint held in the jaws of the hammer hit the steel, sparked the powder in the flash pan, which set off the powder in the quill tube, and that ignited the main firing charge. 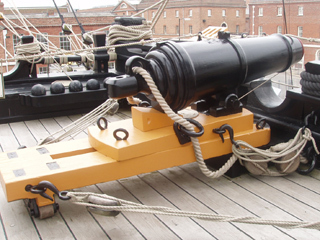 HMS Victory carried 180 gunlocks and three thousand flints, and had supplies of slow match which could be used to fire the gun in the traditional manner if the the gunlock failed or was damaged. 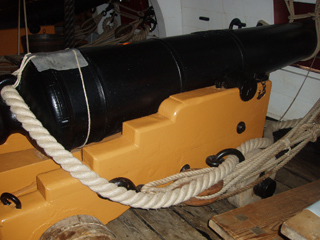 Generally guns were kept loaded, which meant that precautions had to be taken to prevent the powder in the barrel getting damp and failing to fire when needed, and to prevent the gun being fired accidentally. 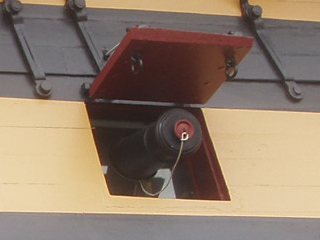 The muzzle of the gun was sealed with a tampion (visible in the exterior shots above), while the vent was sealed with a lead apron. Most of these were a simple 8 inch by 10 inch rectangle; others were shaped to cover a gunlock.